From my childhood, I was very fascinated by detectives and their work. Even on TV till date my favorite serial has been of detectives investigating murder mysteries. It is very much fun for me to wear detective shoes and solve the murder mystery puzzles. Here I am giving you chance to be in detective's shoes and solve many of the murder mysteries. Here many different murder mysteries are given which are investigated by famous detective Sherlock Holmes. He was successfully able to solve all of these murder mystery with logic and carefully doing examination of the clues. While solving these murder mystery puzzles, you have to wear Sherlock Holmes shoes and try to think like him. 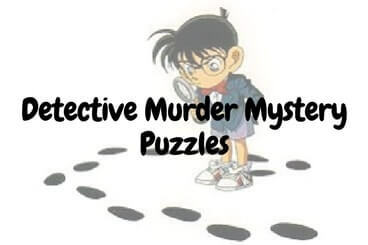 Lets see how many of these murder mysteries, you can solve without looking at the answers. Answers link to these Murder Mystery Puzzles is given at the end of this post. Do post your answers in the comment box of this post. 1. It was first day in the school when a student is found murdered. There were 4 suspected for this murder. Detective Sherlock Holmes calls each of the suspect separately and ask each of them what they were doing during the time of the murder. Below are the reply of each of them. Math Teacher: I was in my room giving grades. Dean: I was in my room all the day. Peon: I was collecting the mails. If you were detective then to who you will instruct the police to arrest? A note is found near Tom's body and following is written on the note. Detective Sherlock Holmes, investigating this case studies this note carefully and immediately arrest one of the four suspects. If you were the detective, to whom will to arrest? 3. A Women murdered on Sunday morning at her home. There are Five suspects. Detective Sherlock Holmes calls each of the suspect in turn and ask what he/she was doing when this murder happened. Husband: I was watching TV. Butler : I was cleaning the closet. Cook: I was preparing breakfast. Maid: I was getting mails. Gardener: I was picking vegetables. Detective Sherlock Holmes immediately orders the police to arrest one of the suspect after listening the statements. If were at the place of Sherlock Holmes, to who will you arrest and why? "I am tired to my life and so decided myself to relieve myself from worldly pains and gun shot"
Detective Sherlock Holmes immediately declares that this is a Murder and no suicide. Why? 6. A lady is found dead in her room with the poison bottle lying beside her body. Initial investigation suggests that she has committed suicide as traces of poison were found in her blood. However detective Sherlock Holmes was called to investigate this case. On arriving the room Sherlock Holmes examined the room very carefully and his finds tickets of her air travel for the evening same day and her suitcase packed in her room. He immediately declares that this is a murder case. Why? 1. Crime Detective Mystery Puzzle: Solve the Murder Mystery with famous detective Byomkesh Bakshi. 2. Iced Tea Murder Mystery Brain Teaser with answer: Can you solve this Ice Tea Murder Mystery Brain Teaser with world famous detective Sherlock Holmes. 3. Japanese Ship Murder Mystery Puzzle: Another Murder in the Japanese Ship and you play as detective to find the murderer in this Japanese Ship Murder case. 4. Dead Wife Murder Crime Detective Mystery Puzzle: This is one of the famous Murder Crime Detective Mystery puzzle. See if you can solve this? Here is answer to 4th Brain Teaser Question of post titled "Out of Box Thinking Fun Brain Teasers with answers to Challenge your Mind ". We have to find A-B=?